He thinks at least one mining magnate can't do maths. He can't. There has been much discussion of how the RSPT excludes a risk-free rate of return from taxation, for which the long-term government bond rate is a proxy. I welcome that discussion, and wanted to devote some of this note to an explanation. The first point to make is that the company tax does not provide such an uplift. It taxes all returns on investment. Royalties provide no allowance for costs of investment or operating costs, and in effect taxes not only the return on investment, but also the operating and investment costs as well. This doesn’t make much difference for highly profitable mines, but it makes a big difference for the mines that have lower returns. Mining companies have said that their required rates of return are higher than the risk‑free rate of return, so the RSPT is taxing some of their normal returns. Mining projects obviously involve risk, and these risks are reflected in their costs of capital. Because mining projects are risky, they need to expect to generate somewhat more than the risk-free rate of return to be viable. However, what has been missed is that the RSPT does not tax the risk premium associated with the company’s capital at risk in a mining project. The explanation for how it does this is not as simple as the explanation for why it doesn’t tax the risk-free return, but I will outline it. The RSPT has two key design elements that have been underestimated in the debate to date. These elements are transferability of RSPT deductions, and refundability of deductions if a project winds up. These two elements were recommended by the Australia’s Future Tax System review. They mean that projects are guaranteed to be able to access the value of the deductions associated with their capital investments, worth 40 per cent of the investments. Because the RSPT shares the risk on both sides, it doesn’t tax the risk premium, it shares it between miners and governments. The Government does receive 40 per cent of the risk premium, but it also shares 40 per cent of the risk. This helps to make start-up mines more viable to develop. This risk sharing does not apply to, say, company tax... Companies can wind up with tax losses for which they cannot recoup any value. The value of their tax losses are, indeed, lost to them. So with company tax, the government does not share on the downside, but does share on the upside. Company tax does tax risk premiums. 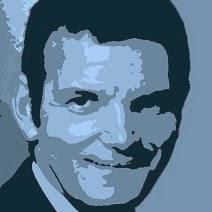 Refundability is not a new feature of the tax system. Other parts of the tax system already offer refundability, such as the R&D rebate. The new Resource Exploration Rebate will also offer it. It is not of as much value to big companies given they can offset deductions against income from other operations, but it is of great benefit to smaller miners who may not be able to do so. Under the RSPT, larger firms will benefit from the transferability of losses similar to company tax. However, unlike company tax, smaller firms will benefit from the indexation of carry forward losses and refundability at project closure. 2. What are the effective tax rates and how do they compare? One mining executive has been vocal this week talking about a 70 per cent RSPT, presumably calculated by adding together RSPT and the company tax rate. This misunderstands so much of the tax design, it’s hard to know where to start. The first point is that RSPT is not additional to company tax, it is in fact deductible from it. The second is that company tax is being cut, from 30 per cent to 28 per cent by 2014-15. The third is that the RSPT applies to less of a mine’s income than company tax (only super profits) and to much less than royalties (which apply to super profits, profits, operating costs and investment costs). The fourth is that effective rates of RSPT vary significantly according to project returns. Projects involving highly valuable resources will tend to pay more tax – to compensate the Australian people for losing a valuable, non-renewable resource. More marginal projects will tend to pay less. The table below shows estimates of the effective tax rate applying to different projects, including both the RSPT and company tax. The table compares the effective tax rates under the RSPT with the effective tax rates applying to a hypothetical resource project operating under existing royalties and the existing company tax rate. Note: Assumes a risk-free rate of 6 per cent and royalty rate is 6 per cent. These estimates ignore the risk-sharing aspect of the RSPT. Therefore these estimates should be taken as an estimate of the tax rate applying to a project that generates, say, a 25 per cent return with no risk. Effective tax rates under the RSPT are lower if the project involves risk, because the risk is shared with government under the RSPT. The table above actually overstates the tax rates under the RSPT because it does not adjust for the point that risk-sharing between the government and the mine leaves risk premiums effectively untaxed over time in the hands of the miner. The table shows that under the Government’s proposed arrangements low profit mines will be better off as they will only pay company tax. High profit projects may pay more tax if their resource profits are significant and the current arrangements undercharged. In contrast, the effective tax rates under current arrangements declines as profitability or the value of our resources increases. It is also important to note that the impact of royalties, and therefore the effective tax rates, will vary significantly across projects – largely depending on the level of investment and operating cost the mine needs to produce a given amount of output. Mines with high costs are punished by royalties, because the royalties apply to their costs as well as their profits. Mines with low costs do relatively well. Because there is so much variation in costs compared to revenues, the table above presents the effective tax rates for a hypothetical project that has average operating costs based on ABS data. 3. How has the share from resource companies changed? In releasing Stronger, Fairer, Simpler the Government made the point that the amount the Australian community charges mining companies for our non-renewable resources has fallen from one dollar in three of profit for the first half of the decade, down to one dollar in seven today. Several stakeholders have responded that this excludes company tax. This is correct. The statistic covers how much the Australian community charges for its non-renewable resources. All companies in Australia pay company tax on their profits. But just because they pay company tax does not mean that Australia should give them our non-renewable resources for no charge. We don’t normally give companies land for free, just because they pay company tax. So it is not correct to argue that Australia should undercharge any company for our non-renewable resource wealth. However, even if we include company tax, the point holds. 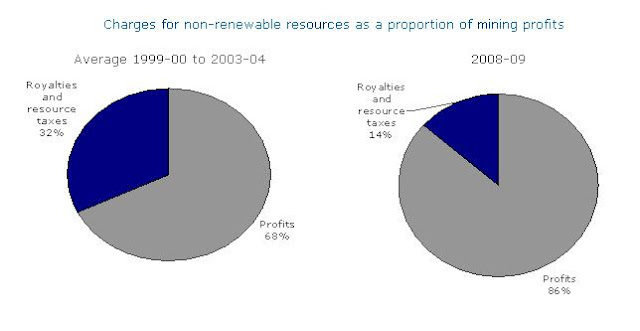 The amount the Australian community charges for its non-renewable resources has halved, as a share of profits, compared to about ten years ago. And the amount the Australian community receive in both taxes and charges for our non-renewable resources has also halved. 4. Will this damage the mining industry? There has also been comment that this change will permanently damage the mining industry. And the outlook is good. Just last year, the largest single investment in Australia’s history, the $50 billion Gorgon project, was approved to proceed. Its tax regime? The 40 per cent Petroleum Resource Rent Tax. In fact the Government will implement important initiatives (on top of removing the worst economic effects of royalties) to further support resource sector growth. Junior mining exploration companies will be big winners from the new Resource Exploration Rebate which will deliver cash rebates, set at the prevailing company tax rate, to companies for the costs of their exploration. Take the example of a mining exploration company which spends $100 million on finding mineral deposits in the first year. As the company does not generate any revenue in that year it is not able to use the expense to reduce any tax payments. It would need to wait until later years in which it generates income before it could realise any tax benefit from the exploration expenditure. From 1 July 2011, the new Resource Exploration Rebate will provide the company with a refund on the exploration costs which for this exploration company would be a $30 million cash benefit. The rebate provides a cash injection into the company giving valuable assistance to the company to continue its resource exploration activities. Exploration companies all stand to benefit from this reform and will have a greater incentive to undertake the exploration necessary to grow our resource sector. And the Government is recognising the importance of geothermal energy by extending the definition of eligible exploration expenditure to include geothermal exploration. We have seen two contrasting approaches from miners this past week. A number of mining executives around this country, led by Clive Palmer, have spent a week warning the sky will fall in as a result of the tax policy we announced on Sunday – rather like what was claimed about PRRT in the 1980s. We’ve had a case of a mining boss announcing the tax would ruin his business and then buying extra shares in his company after they fell. We’ve had a case of a mining company announcing all their projects were shelved, and then reversing that announcement just before the market opened. And we’ve had Mr Palmer announcing the abandonment of a project it appears never existed. Meanwhile, we have had a number of companies – about 80 of them at last count – quietly and professionally engaging in the consultation process. This was announced the moment the embargo was lifted on our tax policy last Sunday at 2:30pm. The first meeting with companies started first thing on Monday morning last week. So you have two very different approaches from the industry – the Clive Palmer faction, with inflammatory rhetoric about despotic regimes and communism. And another, led by professional mining executives, participating in a process already laid down by government, examining the effects on their business and possible transitional arrangements. I can say this very clearly. The second approach will work for companies. The first will not. Threats and abuse will not alter the Government’s resolve. They didn’t in the 1980s and they won’t now. I’d like to finish this note with a message to shareholders. If you are a shareholder in one of the former companies I encourage you to make your views known to your company’s management: calm down, get into the process and engage properly. I can assure all shareholders that the Government is genuine about consultation, and working through the transitional arrangements and detailed design of this important new tax reform for Australia.